In dark times, exhilarating news from Seattle, Washington. 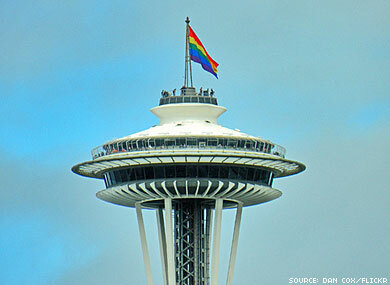 Last night, 6 brave members of Seattle, Washington’s LGBT (Lesbian, Gay, Bisexual, and Transgender) Commission did the simple, honest and right thing. And it took my breath away. And because the backlash is sure to be fierce, if you feel as I do, then I want you and everyone you know who is part of or ally to the LGBT community to thank them. Today. This very moment. In my region of the United States, the Israeli Consulate and militant pro-Israel group Stand With Us partnered to promote a tour of Israeli LGBT activists—not to advance gay rights, but to divert attention from Israel’s occupation and abuses of human rights. Their well-documented strategy to rebrand Israel as a “safe haven” of tolerance, even as millions of Palestinians live under Israeli control without the right to vote, as second-class citizens inside Israel or as refugees—is called Pinkwashing. People throughout the northwest had been organizing for weeks. Groups were hosting teach-ins, organizing protests, writing letters, and making phone calls, and it was working. Activists had already mobilized to successfully cancel events in Olympia and Tacoma earlier in the week. Change was in the air. But the City of Seattle LGBT Commission event was the headline of the whole tour, and in spite of all the organizing, we knew it would be hard for the Commission to stand up for what was right. And then, at an open hearing last night, Seattle LGBT commissioners heard several hours of ground-breaking testimony — from queer Jews who cleared away the debris of anti-semitism accusations, and queer Palestinians who brilliantly detailed the racist and violent effects of Israeli policy in their own lives, and the way that Pinkwashing has furthered that violence by invisibilizing their lives, identities, and communities. My life and upbringing in Washington State isn’t a coincidence. My family settled here after my father’s ancestral home was ethnically cleansed in 1948 Palestine. He became a refugee as a young person, and it is by this very truth, and the trajectories that follow, that have led me to settling in Washington state and Seattle. My queer identity is steeped in and inextricably linked to the dispossession of my family and community by the state of Israel…Events like this have become part of a strategic campaign where LGBT culture is exploited and manipulated to promote the idea that Israel is a great place for all LGBT people. This strategy has come to be called pinkwashing by those who oppose it. It directly hurts queer people like me, and our entire community. Any true dialogue on queer issues in the Middle East has to address the Occupation and include queer Palestinian voices. It was clear that the room was moved by Selma’s and every else’s remarks, but at first it seemed like the event would go on as planned. The chair thanked everyone for coming and informed us that the event would happen anyway. But then something happened that I could never have imagined. One of the commissioners, his voice full of emotion and tears in his eyes, told us if it was up to him he wouldn’t let this event happen. He said it pained him to be invisibilizing the most marginalized LGBT folks in our community. And then another commissioner said he felt sick to his stomach about going ahead with the event, knowing now that it was not just LGBT individuals but state-funded propaganda. Then another said this was one of the most difficult weeks of his life – realizing how little he had known and how much harm he was unintentionally doing. Then another said she didn’t want us to feel silenced. And then someone made a motion for a vote, and all at once, it had happened: this group of courageous and humble public representatives voted with a clear answer: No to Pinkwashing, not in this town. It is not easy to stand up for what is right, and we can’t thank them enough. You can be sure that the LGBT commission will be hearing an enormous amount of criticism for their brave stand. Right now, they are already being flooded by emails telling them they are wrong for refusing to spread government-funded propaganda. Let’s show them that we don’t just protest, we also celebrate. That we have their back, as they’ve had ours. Please join me in thanking them for choosing what was hard, and what was right.